Seabob purchase is often left with the Owner own Supply and left to the tail-end of the build process. Picking from the get-go store can make all the difference to a perfect fit when it comes to function, form and practicality. It is at the early stage of the build that the owner needs to sit down and work out exactly what it is they want their toys and tender to do. There are the questions that should be answered in the planning stages of a new build to ensure the Seabobs perfectly complement yachts performance and meet owner expectations. Toys for the most part, need less forward-planning, but taking a little time to consider them at build stage means the yacht will be launched with a full complement of accessories ready for owners to enjoy. Seabobs are probably the most popular water toys. They are Fun. And it should stay that way. With a wide range of well-executed Seabob Integration Solutions aboard Yachts & Megayachts our experience can be of immense importance to a well designed yacht water toys garage bay. We offer technical expertise and Seabob Integration know-how to support yard’s Design Team during any stage of a new build or yacht’s refit project. Our goal is to ensure best possible Seabob maintenance, handling and owners experience. 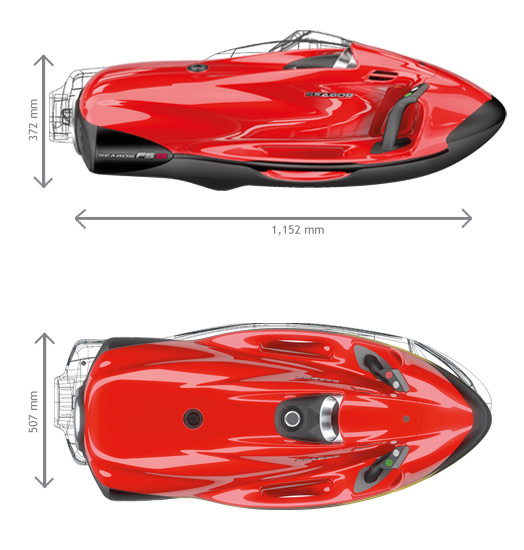 We can provide Seabob technical specifications drawings, technical drawings, seabob accessories tech specs and all related documentation. Tenders and toys are the accessories that complete the yacht owning experience. Fun and functional; if chosen well they will seamlessly integrate into the function of the yacht and make a good guest experience great. Get them wrong, however, and the costs in terms of maintenance, poor performance and owner or guest dissatisfaction will be prohibitive. Explore a wide range of yacht toys available at Ocean Premium Monaco – Toys for Superyachts.